At Dermaskin, our experts only use injected aneasthetic to completely numb your lips so that the whole experience is PAIN FREE. The anaesthetic works within 5 minutes so there is no need to wait hours upon hours. Lips are one of the most visible characteristics of our faces and we should not underestimate the impact that well-defined naturally full looking lips can have. Lip volume is governed by both our genetic code and also by the ageing process and exposure to UV light and pollutants (especially smoking). A loss of lip volume and definition can be detrimental to the balance of the face as can having excessive upper lip creases, or mismatched upper and lower lips. Lip augmentation can be used to correct any deficits or imbalances in the volume of the lips and also to restore their youthful definition. Lip fillers consist of synthesised hyaluronic acid (HA or sodium hyaluronate), which is a natural component of lip collagen. Hyaluronic acid holds water which imparts volume and hydrates the lips. Lip augmentation procedures use the inherent water-binding properties of HA to restore a natural volumised look to the lips. At Dermaskin we promise to make your lip injections completely PAIN FREE by using dental anaesthetic blocks. Do not have any lip work done without an appropriate dental anaesthetic – and remember numbing creams just do not work unless they are held on the lips for a number of hours. Do nothing differently. Just go about your day to day activities as normal. Your lips will be cleansed and sterilised at the time of the procedure so try not to use any lipstick or cosmetics. If having lip plumping and defining, you will need to have an anaesthetic block. This will be injected so that the lips are completely numb and so you will not feel any pain when the lip filler is being injected. Lip filler will be injected into the vermillion border (the edge of the lips where the skin meets the lip itself) and also into the lips themselves in so that the lips have a fuller, poutier and feminine appearance. You will have a mirror to hand and you will be able to see the effect immediately. We aim to get the result that you are looking for and will not overfill your lips – NO TROUT POUT GUARANTEED. The hyaluronic acid is a gel-like solution and is injected into the lips to add volume in the vermillion border and also into the body of the lips themselves. 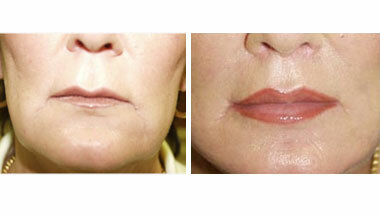 The filler holds water within its molecular bonds and plumping the structure of the lips from within. Hyaluronic acid fillers last from 6 – 15 months depending on how each individual responds to the filler ingredients. Some people degrade the filler faster than others. There is usually some swelling after having a lip enhancement and it is advisable to relax and minimise strenuous activity in the 24 hours after having the treatment.